90s Rei Hino or Crystals Rei Hino? well ALMOST completely faithful to the manga, Crystal does have some small modifications and changes here and there so it's not an "exact" carbon copy of the manga, but it's close enough. At least it's following the storylines & characterisations much more closely and faithfully to the manga than the 90s anime ever was. When it came to Rei, though, they kinda watered down her manga personality for Crystal's first two seasons. It wasn't until the third season that she got back her attitude and sarcastic side that she'd always had in the manga but which was mostly missing from Crystal's first two seasons. That said, I still like Crystal Rei. She's gorgeous and still a good, capable person. have you read the original manga? Crystal is basically just following very closely to the manga both story-wise and character-wise. I'm not ashamed to say that I don't care much for the manga (and I don't care if anyone has a problem with that). Crystal is basically just a poorer version of it in my book. A couple of snide remarks in the third arc is not enough to redeem the character as far as I'm concerned. Or make up for a lack of presence. While I Enjoy Both Rei's Very Much, it is without a Doubt 90's Rei Hino wins easily for me! Thanks to the DiC Original Dub Voices and then to follow the Japaneses and the Viz, Rei always has a Spunky Yet Mature attitude to her. Besides Ami, she was always the most mature and seem to always think ahead. Her Serious made sense when it did, her silly made sense when it did, her suprised moments made sense when they did, her Angry Moments ESPECIALLY with Usagi made sense when they did, her chasing for Love made sense when they did, really IMO she was an all around well put together gal that had so great depth to her. It was this that made her my 1st Favorite Sailor when I 1st become a Fan of the Series! Honestly to while I Love all the Sailors in how Great they are, her pointing out how Ill-Logical it was to have Usagi as the leader in the 1st season I totally agreed with and Made me feel like Mars deserved to be the leader allot of the time. Rei Really brought a Sense on Competency and Realism to the 90's Series that at that Point I had never seen in other shows before and on-top of that it had a progress flowing narrative to it as well! 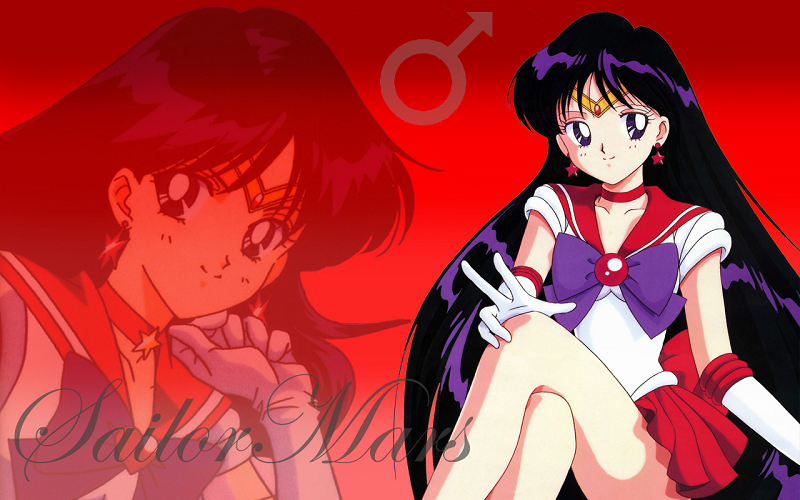 This is why for awhile IMO Sailor Mars seem to be the Best out of the Sailors when I 1st become a fan and it still sticks today, 90's Rei was and still is Very Cool! Pretty Much that is what Drew me into Rei's character, she just told it like it was to Usagi and the others and in allot a ways pushed the team to try to become more aware of their weaknesses and that they needed to mature. While the Fights I agree where a Heck of allot of fun, it was Rei's Hard Medicine the Team needed to take to learn to advance, that and a whole lot of other things. But that is what made the 90's team so Great, DiC-Japanese-or-Viz, we got to see a team of Young heroes form themselves into the Guardians of Earth by giving each other the Truth and Hard Lessons. Honestly Rei was essential to this and Really like you said it Made Usagi and Her Grow allot closer. I think Usagi understood that and in a way in Usagi's own and private way Thanks Rei for being her Hard Conscious. Honest it came to a Very Close Friendship Akin to Rei as the Big Sister to Usagi as the Little Sister. I vote for both of the 90s anime Rei and the manga/crystal Rei because they are both my favorite versions of her. While I love the complex character of Rei in the 90s, I love her manga counterpart more. She is fleshed out throught the story and some shorts as calm, colected, yet deep traumatized and broken person. Crystal, however, didn't have the time to focus on her. If they made Casablanca Memory as act 6 and made act 13 and 14 into one as it was dragging, Rei would have shown some of her manga personality. They removed entierly her grandpa, removed any reference to her father and mother as well as her pendant and further annihilated her character. Yet Crystal has two more arcs to adapt and we don't know what is going to happen with the character. And I would rather talk about character development once the story is over. So in 100 years when Toei are finally ready with it my opinion might change. But so far I love manga Rei, PGSM, 90s Rei and have not a solid opinion on Crystal Rei. Yeah, that was weird, especially when she mentions him later on despite all of his appearances having been cut out. Rei didnt mention him. Usagi did. Once. In season 3.